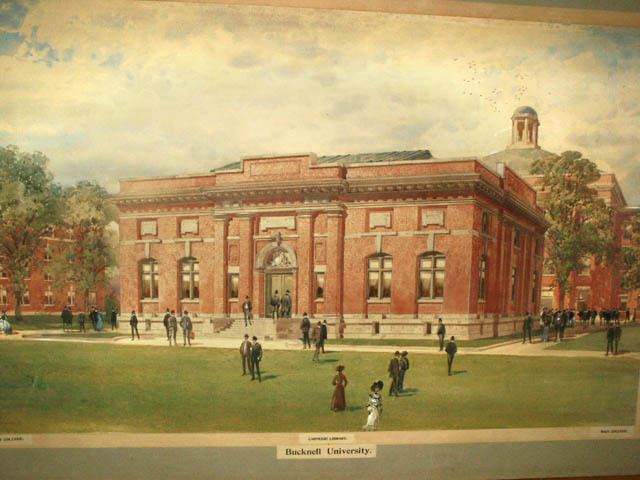 Bucknell's Carnegie Building by Ackerman and Peabody of New York, 1904 (artist's conception - the building was actually constructed slightly differently). The interior was designed by Bucknell President John H. Harris. On January 8, 1903, the Board of Trustees authorized President John H. Harris to apply for a gift of a library building. President Harris drew the plans for the interior of the building. In answering an appeal in 1904 from the Trustees for $ 50,000 for a library building, Andrew Carnegie replied that he would contribute $30,000 if the University would support the library to be housed in the building. Carnegie approved the plans drawn by Ackerman and Peabody of New York, and ground was broken for the building on June 21, 1904. Internet; accessed 29 October 2004.